Summary Updated version of dual-drive Marvell-based NAS with USB 3.0 port, lots of upload/download options and support for add-in modules. 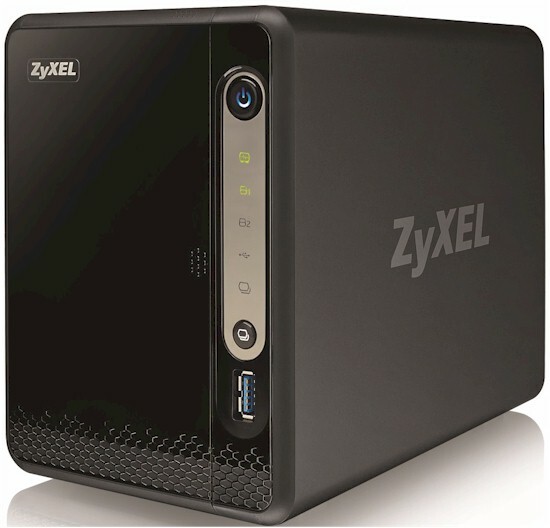 ZyXEL's NSA325 has been a popular choice for buyers looking for an inexpensive two-bay NAS with decent performance and a surprisingly broad feature set. So when someone in the Forums flagged a new version of it, I asked ZyXEL to send one for a look-see. It turns out the v2 has the same hardware as the original, with some minor cosmetic changes and a new drive tray that enables use of both 2.5" and 3.5" SATA hard or solid state drives (the verified drive list has only 3.5" hard drives). Since the v2 is so similar to the original NSA325, this will be a relatively short review. Craig has a pretty complete walkthrough of the NSA's feature set in his review. The front and rear panel callouts and the product photo above show the v2's more muted look. The case is still black plastic, but the front cover has dropped the wavy lines and sports a mirrored bezel to highlight the buttons and indicators. The port complement is still the same--—one Gigabit Ethernet, two USB 2.0 and one USB 3.0. ZyXEL NSA 325 front and rear panel layout. The figure below describes the color and states of each status indicator. ZyXEL told me the v2's hardware has not changed from the original, so I'm reusing the board shot from the original review below. The key components are summarized in Table 1 alongside QNAP's TS-220 for comparison, since it uses the same Marvell SoC and RAM amount. The v2 drew 15 W with two WD RED WD30EFRX 3 TB drives I supplied for testing. The NAS drives properly spun down after the programmed idle time was reached, with power consumption dropping to 7 W.